Career chips are microchips implanted into people's palms to assign them a permanent line of work. The label of each individual chip corresponds to the job that the receiver is best at. 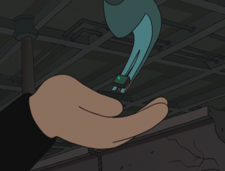 According to Leela and Smitty in "Space Pilot 3000", the career chip is mandated by the law, and anyone who rejects it will be labeled a "job deserter" and "fired out of a cannon into the sun". Despite these warnings, there have been numerous instances in which career chips have been removed without any such legal consequences, implying that these laws are rarely enforced. In 3017, the Hypnotoad hypnotized Professor Hubert J. Farnsworth, making him order the Planet Express crew to take him to Amphibios 9. Once there, the Hypnotoad commenced his buzzing noise, making hypnowaves that revealed the female hypnotoad from a perpendicular universe. The universe was pulled into the hypnowaves, but Lord Nibbler saved Philip J. Fry from being sucked in as well. Fry worked with Nibbler, then later Professor Farnsworth, to restore New New York and the rest of Earth, as well as the other planets in the universe. This page was last edited on 5 November 2017, at 05:01.